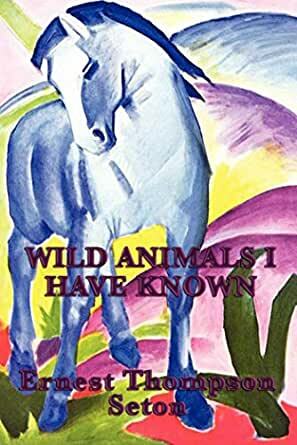 A stirring account of the lives of eight wild animals, including Lobo, the king of Currumpaw; Silverspot, the story of a crow; Raggylug, the story of a cottontail rabbit; Bingo, the story of a dog; the Springfield fox; the pacing mustang; Wully, the story of a yaller dog; and Redruff, the story of the Don valley partridge. Just started reading this and I’m sure the content of the text is good but this reprint is horrible. The print is tiny and there are so many typos. Sad that a reprint couldn’t be done well. "Wild Animals I Have Known" is truly one of those books that deserves its spot in the heart of Americans. Yes, some might find them simpering animal stories, others examples of a time of treating animals best long forgotten. But for those who can get inside the mind of Mr. Seton and just what he wanted to express, this becomes a wonderful read. Seton shares animal stories from creatures he has seen to creatures who get to tell their stories from their own perspectives. Some of the stories are fun, others are downright tragic, but all of them possess a spirited sense of adventure and wonder at the animal world. The telling of the tales is classic, making these wonderful for read-alouds or simply for a silent solo read. A fine testament to storytelling. This book has some wonderful stories in it. However, I would like to note, I read none of them from this book. The book was unreadable (in a comfortable manner). The text gets smaller on some pages, larger on others, the pictures are not that bad however. What really was horrible though was the text columns, and the space left on the sides of the text (especially on the inside near the spine). The publisher decided to put the pictures BESIDE the text, rather than above or below. this then caused the text to be squeezed towards the inside of the book towards the spine. Thus causing the reader to have to crane their necks in order to read. The text is printed essentially inside the spine of the book. As if this wasn't proof enough that this book was rushed to into printing by a company that payed no attention to the books readability, on more than enough pages the text was scanned in crooked and thus cut-off and does not appear in the book. Sometimes entire words are missing. Sure, your mind can fill them in, but I payed for a book, not a half-a** scanned copy. I had the book replaced with another paperback edition of this book which cost 50 cents or so more. Very much worth it. if you want to get a good edition of this book, which includes the pictures as far as I can tell, get "Wild Animals I Have Known (Yesterday's Classics)." The book itself is great, the stories are interesting, enticing, and vivid. I personally bought the book after watching a documentary on "Lobo - The King of Currumpaw." I wasn't sure what to expect, old books can be very dull. This one however really isn't. some of these stories could be great for audiences of all ages. I am personally 18, hate boring books, find Shakespeare dull and over dramatic, and any sort of literature written to before 1900 to likely be the epitome of dull and the definition of bad writing by todays English standards. Some of these stories have some ugly images (not drawings) which if understood by a younger mind could cause some bad imagination repercussions. They gotta grow up sometime! But this book really isn't for just anybody. It's targeted at everyone however, it affects many when put into context, and greatly effects those that have a love of learning, adventure, and animals. Overall the book was and is worth a read, ill keep it and read it in 20 years. 5.0 颗星，最多 5 颗星Like reading the stories my grandfather told. There is the ring of truth to each of these short stories. I found myself transported back sixty+ years, snug in Pop's lap listening to his tales of the years he spent as a cowboy on the plains and in the canyons of the Texas panhandle at a time when 'lobo' (prairie wolves) and cougars still roamed the area. A thoroughly enjoyable collection of stories by an author who most definitely knew of what he wrote. I highly recommend this book to anyone interested in experiencing how it was.